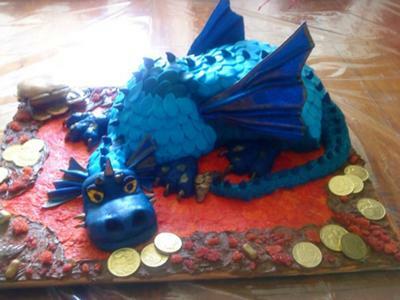 This dragon cake was made with dark chocolate mud and white chocolate cakes. I used a Dolly varden tin for the front of its body and I used a 13 inch round for the cake of his body . I marked fondant icing and rolled it thin and put a layer of it on the cake first and the i used a rose petal cutter to cut out the scales for his body I used different color blues as this is what my son wanted I used fondant for his head and tail and legs and I used gum paste for the wings on his back and head and attached them to him with royal icing. I used a gold luster dust to give him some character and this horns are made of fondant as well and down the back of it spine the board is covered in royal icing red and orange to give it a lava look. I used brown icing for rocks and used colored sugar to make it look like the lava came out and splashed up on to the rock. I also used gold chocolate coins for his treasure this cake was a big big hit! Can you please give a clue as to how to did the wings? My little man is dying to have this cake and I think I can manage the rest but the wings are a challange. This is definately in my top 5 favorites! WOW!!!!!!!! !